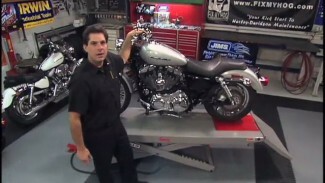 Step-by-step video on installing Progressive shocks on your Harley-Davidson. Watch the pros do the installation so you can do-it-yourself and save some shocking labor costs. These shocks are easy to adjust for solo or two up riding with the twist of the shock no more spanner wrench needed. Ride solo and pick up a friend and adjust the shock as needed.